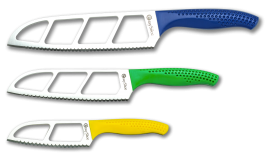 EasySlice guarantees your knife will be free of defects in materials and workmanship. Any defective knife will be repaired or replaced free of charge; simply ship your knife to the address below. This warranty gives you specific legal rights and you may also have other rights which vary from state to state. 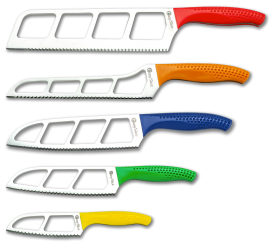 EasySlice guarantees your knife will remain sharp for 10 years. If your EasySlice knife becomes dull, simply ship your knife to the address below and it will be sharpened and returned to you, free of charge. · Recomended to hand wash.
· Always use caution when handling sharp objects. · Store knife in a safe place to protect its edge and to prevent injury.